Tocino de Cielo is a dessert that is a tradition in Southern Spain. 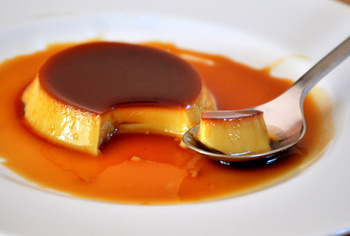 It is very similar to flan, especially in appearance, but the two desserts are made with very different components. A flan is made with whole eggs, and milk or cream (usually both), while tocino de cielo is made only with egg yolks, sugar and water. That might actually sound too simple, but this combination of ingredients leads to an extremely light and tender custard – much lighter than a traditional flan or creme caramel – with a fantastically smooth mouth feel. The name actually means Bacon from Heaven – although it contains no bacon – and there are a variety of stories that try to describe how the name came to be. The dessert itself originated in Jerez de la Fronteta, a city in Andalucia that specializes in sherry production, and egg whites were used to clarify the sherry. This led to a surplus of yolks available for cooking. This custard was perfect for using up a whole bunch of egg yolks in one dish. To prepare the custard, a sugar syrup is infused with some citrus, and is then cooled and blended with egg yolks before being poured into ramekins. I used both lemon and orange to flavor my syrup, cutting a 2-inch strip of the zest off of each fruit and adding it to the syrup. The ramekins, which are prepared with a layer of caramel at the base before bring filled, are baked in a water bath until the custards are set. The dish originated as a way to use up leftover egg yolks and is still is a wonderful way to put leftover egg yolks to good use. It is also a good way to create a surplus of egg whites for angel food cake and meringues, because these custards are so heavenly that you’ll want to make them on a regular basis. In a small saucepan, cook 1/2 cup sugar over medium-low heat and stirring regularly, until it comes to a medium amber color. Remove from heat and divide evenly into four 6-oz ramekins.Â Set aside. In another small saucepan, combine remaining sugar with water and the strips of orange and lemon zest. Bring to a boil. Using a candy thermometer, cook until sugar reaches 220-225F. Remove from heat and cool to room temperature. Remove zest strips and stir in vanilla extract. In a large bowl, whisk yolks to combine. Whisk in cooled sugar syrup until well combined. Strain mixture into a measuring cup or bowl with a spout. Pour egg yolk mixture into prepared ramekins, dividing mixture evenly between them. Ramekins may not be completely full. Place ramekins into a shallow baking dish (I use a 9×9-inch pan) and place into the oven. Carefully pour hot water into the baking pan, making sure that the hot water comes about 2/3 of the way up the sides of the ramekins. Bake for 40-50 minutes, until custards are set. A sharp knife inserted gently into the center of one of the custards should come out clean, and they should jiggle only very slightly when moved. Carefully remove ramekins from water bath and allow to cool to room temperature. Cover with plastic wrap and refrigerate for at least 2 hours, until cold, before serving. To serve, slide a sharp knife around the edge of the custard and invert onto a serving dish. I *LOVE* tocino de cielo. It’s a pity it’s rarely good in restaurants and that it’s one of those recipes that I simply haven’t managed to master. I guess I’ll have to practice more often. Do you think honey could replace the syrup that is blended with the yolks? Sylvia – You could give it a try, I have never used honey in this recipe. 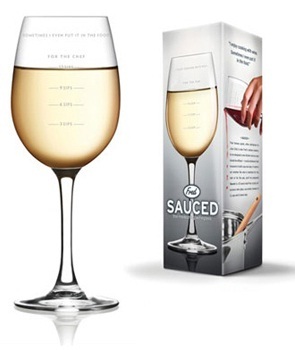 Just made this, well it’s in the oven… If it works I will be very surprised. The syrup/yolk mix barely fit in two ramekins… No chance of getting it into four. Very strange. I am not expecting it to end well!! Just made it as well. Two batches. Wouldn’t even go into 6 small ramekins. Best to do double the recipe and have 4 ramekins. Waiting for it to cool down to pop into the fridge! My small dud one tasted really good tho, couldn’t help eating it! Just made this. Since I didn’t have small ramekins, I used two 14-oz dishes. I probably could have used only one dish, but it’s delicious. Plus, it was perfect for using those yolks after separating eggs for meringues! Made this today with 1 dozen leftover egg whites from an angel food cake.. Flavor was amazing but bottom(top) caramel was hard as rock! HELP!!!! Made this yesterday, it turned out really good. As mentioned on other posts you can probably make 2 ramekins with this quantity. It was a bit overly sweet for my husbands taste so I’ll half the sugar next time. The caramel does harden but I read somewhere that if you let it cool for long enough It’ll moisten and melt the caramel. Which is what happened in my case. I made it in the afternoon and refrigerated it at 2 pm. It was perfectly turned out at 8pm. Definitely making this again! I made this yesterday because I had so many extra egg yolks, and it was delish! Only complaint is that the sugar that melts into syrup is a little too sweet, even for my extreme sweet tooth, I found the sugary bottom just a little too much to handle. I suggest cutting the sugar portion in half or even getting rid of the first 1/2 cup of sugar all together, because the syrup was just there for extra sweetness. My sugar is also slowly cracking at the bottom of the ramekins? Help, why is this happening? I’ve been searching for recipes just for all the left over egg yolks I accumulate from eating healthy. I made it last night for my kids and they came out delicious. I make flan all the time so to me this was much easier meaning less ingredients. Thanks for sharing.